Where to find usits easy! B&B Alverà is situated close to the centre; just a few steps away form Alexander Hall, and can be easily reached by a 500 meter stroll. Our B&B is located close to the ski lifs of the Tofane Mountains which host the Ski World Cup. It is therefore ideal for ski lovers. 50 meters way from us there is a ski-bus which will conveniently take you to any other ski areas. Ski-pass holders benefit from free bus service. Located near our B&B there are saunas & wellness centres, tennis courts, the Olympic Ice Stadium and the planetarium. The main railway line is the Venezia-Calalzo di Cadore. 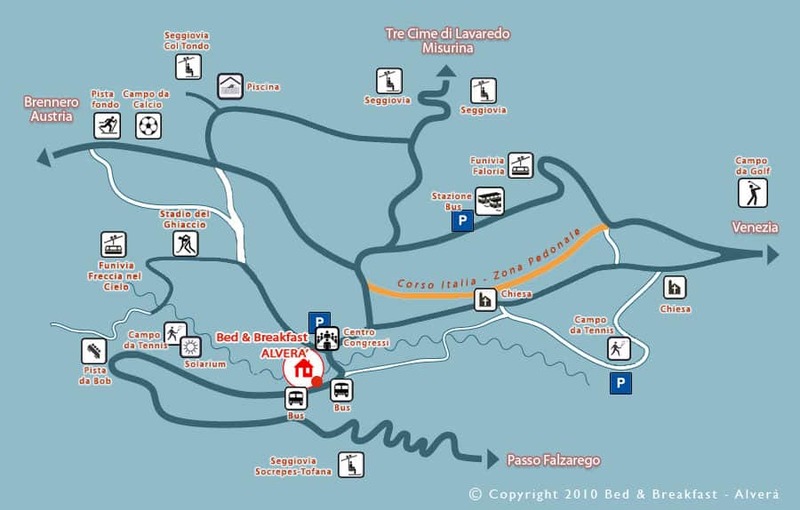 From here you can catch the public bus which will take you to Cortina. Once you arrive at the Cortina bus terminal, catch the bus 3 or 3a which will take you directly to Ronco. If you arrive from the South, Cortina can be easily reached from Mestre via A27 Venezia-Belluno, by leaving from Pian di Vedoja (Belluno) anc continuing towards sate route SS51, which leads to the city centre of Cortina. From here, you can follow the street signs to Pocol-Passo Falzarego, route SR48. If you arrive from the North from the highway A22 del Brennero, leave form Bressanone and take the route toward Dobbiaco. Cortina is approximately 1hr away from Bressanone. Venice’s airport is 150km away from Cortina. It can be reached following the directions mentioned above. You can also benefit from regular bus services to and from Venice which also stop at Mestre and Treviso. During high season, various bus services are available. These services connect Cortina to some of the other cities of northern Italy. Regular bus services are also available from and to Venice with stops at Mestre and Treviso. During high season there is daily service, in other periods it is available only on Saturdays and Sundays.